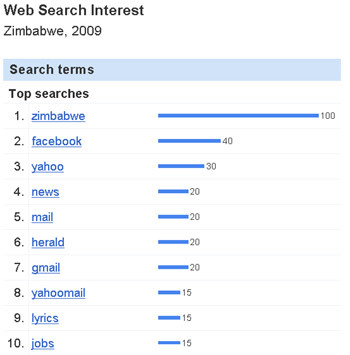 According to Google Insights for Search, Zimbabweans just love facebook. We love it so much it’s in the first four spots in 2009’s top ten rising searches. 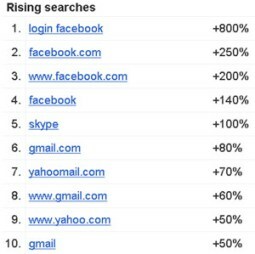 At number 1 as “login facebook” then 2 as “facebook.com”, 3 as “www.facebook.com” and 4 as just “facebook”! Ok, I’m surprised too. I also thought the shortest distance between a surfer and his web destination is a straight line; typing “facebook” into the address bar and having it brought up in the cached addresses. Looks like people don’t want to be bothered using the browser address bar, once the Google homepage is loaded; it’s the Google search box for everything. We’ll talk more on that later (update: here it is “Users Love Typing Website Addresses Into Search Engines And Google Understands That“) ; let’s check out what else is rising in popularity. Number 5 on rising searches is VoIP tool “Skype”. Again, normally if you want to download Skype you’d just type it into the address bar and you’d have the Skype download button in your face begging you to click it, within seconds (well maybe minutes on a typical connection around here) so why people Google Skype is anyone’s guess. Position 6 and 7 is “gmail.com” and “yahoomail.com” respectively. The same sites on the rest with “www.gmail.com” taking up 8, “www.yahoo.com” 9 and “gmail” on 10. 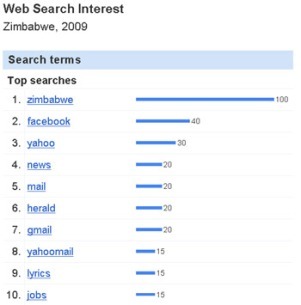 So there you have it, the most rising searches on Google are basically just the most popular websites in Zimbabwe! The general top searches list below is not much different with just “news”, “mail”, “herald”, “lyrics” and “jobs” added to the mix. Yes, “lyrics” is a hot search term in Zimbabwe! Probably means more young people than middle aged and old use the net frequently. No surprises on “jobs” though, hey, brothers and sisters are looking, very normal. The numbers on the graph according to Google reflect how many searches have been done for a particular term, relative to the total number of searches done on Google over time. They don’t represent absolute search volume numbers, because the data is normalized and presented on a scale from 0-100. How do these trends compare to other African countries? Mostly the same with South Africa. They have “lyrics” on number 4 on their top 2009 searches. “Facebook”, “jobs”, “games” and “gmail” in there as well. Kenya also has almost similar trends but in addition has “quotes” and “youtube” (these guys must have good bandwidth hey) in the rising searches list. On a worldwide scale “michael jackson” ranks number 1 on rising searches. Second, third and fourth is all “facebook”. “youtube” is on number 5 and “tuenti”, Madrid-based, invitation-only private social networking website on number 6. The rest is just web email sites. Interesting that there are no local searches. A Gap i see.